August 27, 2012 (Vancouver) – Spartans vs. Vikings if these two armies stood upon the mighty field of battle and went to head to head, Xiphos Short Sword to Longsword, Spear to great axe; which powerful stronghold of their time would win? Well, Charlie Bewley might have that answer, set to play Viking royalty in his next feature length film, Hammer of the Gods. Since early May, shooting has been underway in London on Vertigo Films’ Viking story Hammer of the Gods, the debut film from Farren Blackburn, sets the stage and Charlie Bewley has a staring role, as Steinar. The film follows a young Viking warrior, Steinar; sent by his father the King on a quest to find his estranged brother. Steinar’s epic journey across terrifyingly hostile territory gradually sees him emerge as the man his father wants him to be – the ruthless and unforgiving successor to his throne. Charlie’s new film is described as “a visceral, intense tale set in a world whose only language is violence”. Set in Viking Britain in 871 AD; some of which is the first ever historically documented barbaric sagas in Viking history, is the dramatic exodus of the Hammer of the Gods – will be born. Sarah: Without giving away the details of film, can you offer your fans some insight into who is Steinar, what kind of a young man is he, what makes him Viking warrior? Charlie needs no introduction, his acting talent is diverse and fans adore him for his role in the Twilight Saga as Demitri; the ever so famous, handsome tracker and guard for the Volturi. In this film; he plays a much different, yet dark role in Hammer of the Gods. Sarah: What similarities or differences are there between your role as Demitri, in the Twilight Saga, and Steinar in Hammer of the Gods? Charlie: Demetri differs in arrogance. Although I believe arrogance is a tag given, not earned; an objective viewpoint, I understand that the confidence exuded by my vampire character could be misinterpreted. Steinar would be deemed, simply, stubborn. It’s difficult to say what Demetri’s cause is without sharing a few beers with Stephanie (author of the Twilight Saga series), but my interpretation is that he is just looking to enjoy the moment, with respect to his own desires: he is fast, strong and loves people; a real charmer… Knows he is good in a one-on-one…. Bt also brilliant in battle. “This will be an exciting, barbaric, stylish and heroic film that will entertain genre fans around the world,” said Producer Rupert Preston. On September 22, Team “Hammer of the Gods” which includes Charlie Bewley and Vancouver native Sarah Jamieson will be competing against the “Spartans” in the Super Spartan Event Challenge in Squamish BC, a “promotional” play to kick off his new upcoming movie Hammer of the Gods, to be released sometime in winter of 2012. Voted best obstacle race by Outside Magazine this epic race of grandeur has been the global leader in Obstacle Racing since 2005, originally designed by seven insane ultra athletes and a Royal Marine. The super Spartan provides an 8+ MILES / 20+ OBSTACLES battlefield of insane mud running with 15 or more obstacles to test your physical strength and mental resolve. Given both Charlie and Sarah’s ultra running background, they hope to take top spot in the race and prove Vikings really are faster, stronger, braver and well… crazier than Spartans. For Charlie’s upcoming role he had to undergo a grueling training regime, which has duly prepared him for the Spartan Race as well. Sarah: Luckily, your background as an athlete is quite extensive, being a Rugby player as well as an ultra distance athlete. The movie sounds incredibly intense, how did you have to train for your role? No doubt, the team may just place in the top spot. 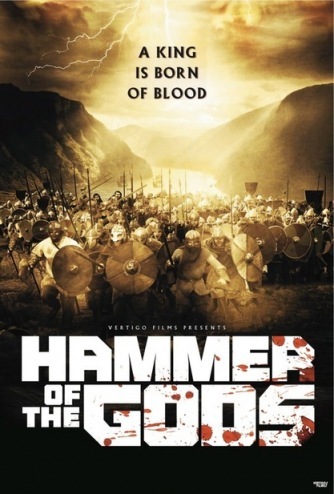 Hammer of the Gods Cast includes Charlie Bewley (Twilight Saga: New Moon, Breaking Dawn part 1 and 2, Like Crazy, Soldiers of Fortune) stars as Steiner, alongside Ivan Kaye (Layer Cake, Dark Shadows) and James Cosmo (Braveheart, Game of Thrones). Matthew Read is the script writer. A Roadside Attractions release of a Highbridge Prods. presentation of a Globus Films (Russia) production in association with Crombie Films and Most/Rice Films. Produced by Robert Crombie, Jay Ellison, Jeff Most, Natalya Smirnova. Executive producers, Jeff Rice, Richard Salvatore. Directed by Maxim Korestyshevsky. Screenplay, Alexandre Coscas, Robert Crombie, Joe Kelbley. With: Christian Slater, Ving Rhames, Sean Bean, James Cromwell, Colm Meaney, Dominic Monahan, Charlie Bewley, Oksana Korostyshevskaya, Gennadi Vengerov. With a pulpy scenario hand-tooled for filming in any anonymous foreign clime, and Christian Slater in the sort of two-fisted lead role that once provided steady employment for the likes of Chuck Norris and Michael Dudikoff, “Soldiers of Fortune” resembles nothing so much as the formulaic ’80s action fare once churned out by Cannon Films for fast international playoff. Nostalgic genre fans might deem this by-the-numbers B-pic sufficiently see-worthy during its limited theatrical run. But most other curiosity seekers will prefer to take their trips down memory lane in homescreen platforms. Capt. 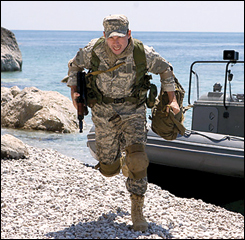 Craig McCenzie (Slater), a fallen-from-grace Special Forces vet, gets a shot at redemption — or at least a hefty paycheck — when he’s offered the job of overseeing “the ultimate in extreme vacationing,” a program that enables bored billionaires to enjoy firsthand combat experience under the protection of battle-tested professionals. Without fully overcoming his initial misgivings, McCenzie agrees to train five disparate one-percenters — a mining magnate (Sean Bean), a telecommunications mogul (James Cromwell), a cocky arms dealer (Ving Rhames), a hedge-fund tycoon (Charlie Bewley) and a designer of violent videogames (Dominic Monahan) — for a covert mission to transport weapons to rebels in a mineral-rich island nation ruled by a ruthless dictator (Gennadi Vengerov). The plan, according to a darkly beautiful rebel lieutenant (Oksana Korostyshevskaya), calls for the billionaires and their highly trained, heavily armed bodyguards to land on an unguarded shore of the Black Sea atoll, deliver the weapons and beat a hasty retreat. But of course, everything goes terribly wrong early on, and it’s left to McCenzie and his not-so-wild bunch to topple the dictatorship without getting killed first. Here and there, helmer Maxim Korestyshevsky plants a few wink-wink hints that he’s not unaware of the pic’s absurdities. (A straight-faced, over-the-cop commercial for the “extreme vacationing” service is a genuine hoot, recalling the similarly outrageous ads in Paul Verhoeven’s “RoboCop.”) For the most part, though, he’s content merely to transcend the obvious budgetary limitations, sustain a vigorous pace and keep out of the way of his cast while shooting in various locales throughout Bulgaria. The script is so thinly written that the main characters are defined almost entirely by the actors playing them. Fortunately, seasoned pros Slater, Rhames and Cromwell are able to flesh out their boilerplate parts, and Colm Meaney tosses some tasty ham into the mix with his broadly villainous turn as an ex-CIA agent (now employed by the dictator) with an old score to settle with McCenzie. As the aforementioned rebel lieutenant, the only significant femme character in “Soldiers of Fortune,” Korostyshevskaya doesn’t take off her clothes, make love to McCenzie or reveal herself as a traitor; in a genre pic as predictable as this, that’s what passes for novelty. Camera (color), Masha Solovyova; editors, Igor Litoninskiy, Jen Ruvalcaba, Jason Yanuzzi; music, Joseph LoDuca; production designer, Nikolai Ryabtsev; costume designer, Natalya Sokolova; sound, Lev Ezhov; assistant director, Charles Leslie. Reviewed at AMC Studio 30, Houston, Aug. 4, 2012. MPAA Rating: R. Running time: 94 MIN. Here is a cute new pic of Charlie Bewley by Jupiter Baudot! Enjoy!